Kayaking Guided Tours with a multilingual guide (all tours are provided in Spanish, English, Dutch, French or German). Explore the largest Mangrove Forest Reserve of Costa Rica and Central America in a silent river kayak and observe many different birds, white-faced monkeys, raccoons, the occasional crocodile or other wild inhabitants in their natural surroundings. 2 ½ to 3 hours. Explore the longest river of Costa Rica by river kayak. Glide slowly through the hushed, cathedral like mangroves to reach the 17-mile long Garza Island.There enjoy an hour or 2 exploration time watching the wild inhabitants of the island and mangrove forest, or play and swim on Garza Beach.You can also do this tour by «panga», a small-motorized riverboat. 3 to 4 hours. We drop you and your kayak at Puerto Cortes (20 km/12.5 miles upstream). From there you can paddle downstream, exploring the many faces and moods of this incredible river. 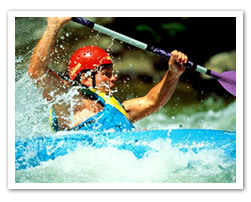 Novices with good physical condition can navigate the river. A guide will accompany you on your journey into the largest mangrove forest reserve of Costa Rica. 5 or more hours: depends on the tides. Panga is a small motorized riverboat. Experience the many faces of the Terraba River. Visit crocodiles and caimans, also woodpeckers and all other sorts of marsh birds in their natural habitat. See the remains of the United Fruit Company´s narrow gauge railway bridges. Before returning, you can stop at a landing in Puerto Cortes for a snack and/or drink. 4 or more hours. Departure time depends on high tide. 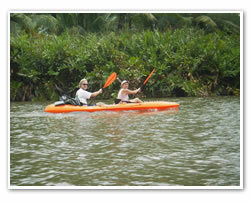 Come to our ecolodge and enjoy the kayaking tour options available. Kayaks are also available on site for rental. The islands just off-shore from Playa Ballena boast some of the best snorkeling along the Southern Pacific coast. They are about a 20 minute kayak from the shore. From December to April you can often see whales, dolphins and sea turtles in these waters. It is a breeding ground for many whales. 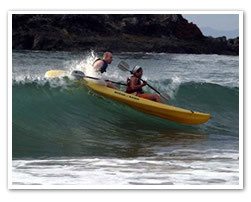 In Mar y Selva you can enjoy the best Kayaking Tour near to Dominical, Ojochal or Uvita.